Before the 360˚ videos for your scenario will be filmed, you can add camera locations to your scenes which can guide the film crew from which position the scene's video should be filmed. 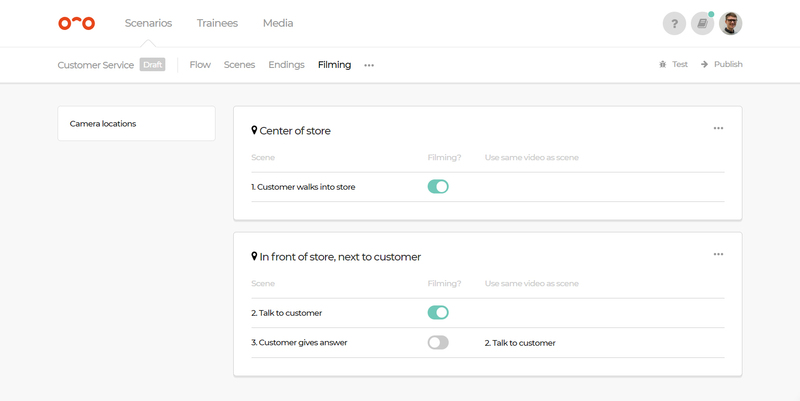 For example: in this customer service training, in the home scene 'Customer walks into store', the position of the video needs to be filmed from the center of the store. Hover your mouse cursor over the scene, press the three dots and then press 'Camera location > Add new camera location', and let's name it "Center of the store". In the next scene the trainee will talk to the customer, so this scene will be at a different location. Let's add a new camera location to that scene and name it "In front of store, next to customer". Scene 3 "Customer gives answer" will also use this location. In the 'Filming' tab you can see the overview of all the scenes with (missing) camera locations. Here you can check if certain scenes need to be filmed or not, because certain scenes might use the same video as another scene. In this case, scene 3 "Customer gives answer" will use the same video as scene 2. Here you can also re-order the camera locations, which could be important when you start filming your 360° videos. When all scenes have a camera location and the scenario's videos are ready to be filmed, you can export the scenario as a handy checklist to print out and be used by the filmcrew to add a check mark next to the scenes that have been filmed. Read more about exporting your scenarios here.